The following is a list of books, monographs, magazine articles, and other materials about El Cerrito and the surrounding area. All of the items on the list are in some way “about El Cerrito”. For example, Harem Scarem in El Cerrito is a book about growing up in El Cerrito; the Richmond Independent newspaper Special Souvenir Edition talks about the greater Richmond area in 1910, part of which became El Cerrito; Richmond – Windows to the Past is a book that includes a section about the town of Stege (part of which was incorporated into El Cerrito); Tales from the Iron Triangle is a book about growing up in a neighboring community which should be of interest to any student of El Cerrito’s history. For each item on the list, we have tried to indicate the place most convenient to El Cerrito where that item can be found (most of these items are available from multiple sources). These locations were correct when this list was first published in Spring of 2007. Please notify the El Cerrito Historical Society regarding any errors in this list or any items missing from this list. El Cerrito Historical Evolution; by Edward Staniford; 1976; 116 pages; Contra Costa County Library. An excellent history of the social and historical development of the City of El Cerrito. Not in print. Click here to download an electronic version of this book (14 Meg). Harem Scarem in El Cerrito; by Neva Carpenter; 2006; 105 pages; Contra Costa County Library. A delightful book about the life of a young girl in El Cerrito in the 1930’s. In print. This document can also be found here. Images of America: El Cerrito; by the El Cerrito Historical Society; 2005; 128 pages; Contra Costa County Library. A collection of pictures and historical snippets about El Cerrito. In print. Images of America can also be found locally. "Images of America" can also be found at: Barnes and Noble, El Cerrito, El Cerrito Natural Grocery, Pastime Hardware, and The Glenn Custom Framing. Mira Vista Golf and County Club; by Marge Collins; 1990; 163 pages; Contra Costa County Library. This book tells the story of the Mira Vista Golf and County Club back to its founding in 1920 (at that time it was known as the Berkeley Country Club). Not in print. Parish of St. John the Baptist 1925 - 1975; by Father William N. Abeloe; 1975; 80 pages; Contra Costa County Library. A pictorial and written description of the first Catholic Church in El Cerrito on the occasion of its 50th anniversary. Not in print. Aboriginal Population of Alameda and Contra Costa Counties from Anthropological Records magazine; by Frederick Sherburne Cook; June 1957, V16 No. 4; 26 pages; Contra Costa County Library. An analysis of aboriginal populations in Alameda and Contra Costa Counties with a special emphasis on listing the sources of knowledge. Includes a map showing the approximate areas inhabited by the principal tribal groups. The Adobe at Cerrito Creek; by Earl L. Scarbrough; 1975; 10 Pages; Contra Costa County Library. This document describes the Adobe that Victor Castro and some of his brothers built just north of Cerrito Creek. 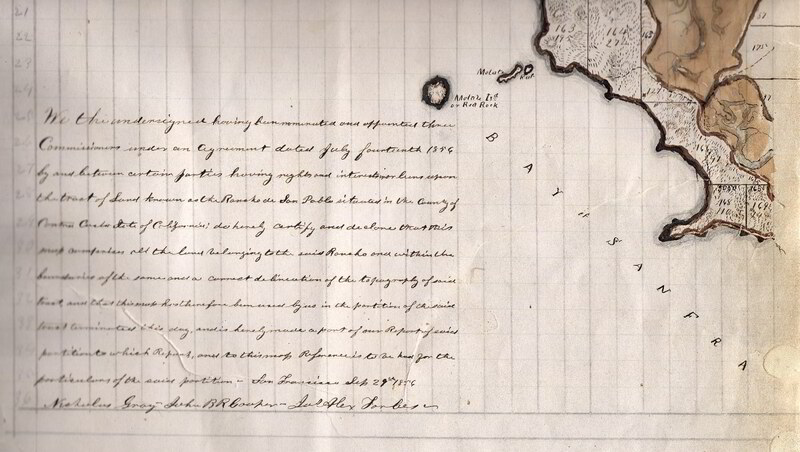 Alta California, 1840-1842: the journal and observations of William Dane Phelps, master of the ship “Alert”; William Dane Phelps; 1983; 364; Berkeley Library. This is the diary of Captain Phelps. During his visit to California he spent considerable time ashore and describes very clearly what he saw and experienced. Click here to see an excerpt that describes his visit to Victor Castro’s Adobe in December of 1841. He provides an excellent description of the Adobe in its early years. An Approach to the Study of the Impact of BART on the El Cerrito station areas; by Joel J. Sanberg; 1970; 16 leaves + maps; University of California Library Library. A graduate report on how BART has impacted the areas near the BART stations in El Cerrito. An Avalanche Hits Richmond; by J.A. McVittie (Richmond City Manager); 1944; 141 pages; Richmond Public Library. This report describes the impact of World War II and the shipyards on the City of Richmond. Richmond grew from 25,000 people in 1941 to over 100,000 in 1945. The Bench and Bar of Contra Costa County; by Wayne A. Westover, Jr.; 2002; 160 pages; Contra Costa County Library. An excellent resource on the history and development of the court system in Contra Costa County. Blake Estate Oral History Project; by Suzanne B. Reiss; 1987; 583 pages; Contra Costa County Library, this document may also be downloaded in text or .pdf format from www.archive.org/details/blakeestateoral00riesrich. Interviews with a number of individuals about the Blake Estate and the Blake family. Blake Garden - A History of Landscape Change; by Linda Jewell and John Norcross; 2006; 55 pages; Contra Costa County Library. A description of the Blake Garden history, development, environment, and landscaping. Nicely illustrated. Blakemont Drainage Study ; Contra Costa County Flood Control and Water Conservation District; 1992; 12 pages; vertical file at the Kensington Library. A review of water, infiltration, and drainage in the Blakemont Landslide area. The Blues Route ; by Hugh Merrill; 1990; 236 pages; Berkeley Public Library. This book is the story of Hugh Merrill's encounters with the blues as he travels across America . His encounters include time in San Francisco , Oakland , and El Cerrito. The Boy who Wanted a Saddle; by the Richmond School District third grade study committee and students; 1955; 44 pages; Richmond Public Library. This book for grade school children tells how California was first colonized by the Spanish, describes the Castro family who owned Rancho San Pablo, tells the fictional story of two young children who come to California form Mexico, and describes how American pioneers moved west. 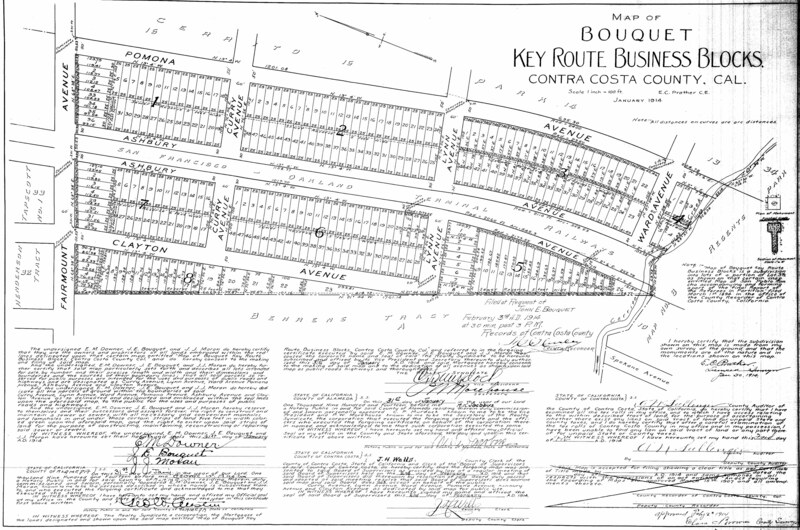 Bouquet Key Route Business Blocks tract map ; E. C. Prather; 1914; 1 page; this document can be found here. This map shows the borders of the Bouquet Key Route Business Blocks subdivision. The subdivision is part of the legal description of El Cerrito. California - A Guide to the Golden State ; by The Federal Writers Project of the Works Progress Administration; 1939; 713 pages; Contra Costa County Library. This volume was produced as one of thousands of government-sponsored projects during the Great Depression. It includes a short but interesting description of El Cerrito . The adjacent short descriptions of San Pablo and Richmond also make good reading. The California and Nevada Railroad; by Erle C. Hanson; 1991; 65 pages; Contra Costa County Library. The definitive work on the California and Nevada Railroad, which ran north from 40th and San Pablo in Oakland through Berkeley, onto the right-of-way used today by BART through Albany and El Cerrito, north to San Pablo Creek, and then up the creek to a point beyond today’s City of Orinda. The California and Nevada Railroad from Western Railroader magazine; by Erle C. Hanson; July 1958 issue #225; 12 pages; reference pamphlets file at the El Cerrito Library. A description of the California and Nevada Railroad, which ran north from 40th and San Pablo in Oakland through Berkeley, onto the right-of-way used today by BART through Albany and El Cerrito, north to San Pablo Creek, and then up the creek to a point beyond today’s City of Orinda. California County Boundaries; by Owen C. Coy; 1973; 345 pages; Contra Costa County Library. The definitive work on the origin & changes in California county boundaries from the original 27 counties to today’s 58 counties. California Family History Material; Soberanes, Irene; 1956; ~130 pages; University of California Library. This manuscript contains a significant amount of genealogical information on several of the families that came to California as part of the Anza expedition. It includes material on the Bernal, Berreyesa, Castro, Galindo, Higuera, Pacheco and Soberanes families. California Milks; by Donald E. Lord; 1984; 302 pages; El Cerrito Historical Society. This book is the definitive work for collectors of California milk bottles. It includes listings for several dairies in the El Cerrito area. California’s Contra Costa County an Illustrated History; by George Emanuels; 1986; 251 pages; Contra Costa County Library. This book provides a history and description of each town in Contra Costa County. It has been noted that there area number of instances in which this volume conflicts with other contemporary histories. California & Nevada Line; You can click here to see a very useful map of the California & Nevada line, ca. 1895, between Emeryville & El Cerrito" at the end of the "The California and Nevada Railroad; by Erle C. Hanson; 1991" entry in EC in Print. The map is attached; thank you very much. Casas and Courtyards; by Helen S. Giffen; 1955; 153 pages; Alameda County Library. This book has descriptions of a number of the Spanish Adobes in California, including Victor Castro’s Adobe in El Cerrito. Castro Adobe Fire; by Earl Scarbrough; 1961; 3 pages; reference pamphlets file at the El Cerrito Library. A description of the 1956 fire that destroyed what remained of the Castro Adobe. The fire occurred shortly before construction was to start on the original El Cerrito Plaza and on the day after a feasibility study on preserving the Adobe had commenced. The Chessmen; by Ken Kokka; 2002; film/DVD - 18 minutes; Contra Costa County Library. This film tells the fictional story of the changing of the guard at a Japanese nursery. It is based on the short story by Toshio Mori. It was filmed at the Sakai and Oishi nurseries in Richmond, where the oldest greenhouses in California were located when the film was made. The Chung Mei Home and Ming Quong Home; produced by Philip Chan; 2003; film/DVD - 15 minutes; Contra Costa County Library. This film was produced for the joint reunion in 2003 of the Chung Mei home for boys of Chinese descent and the Ming Quong home for girls of Chinese descent. It includes a number of vintage pictures of the homes and residents. The City of El Cerrito, California; by Judson C. Clark; 1962; 18 pages; reference pamphlets file at the El Cerrito Library. A description of the organization and operation of the City of El Cerrito. City of El Cerrito: on shaky ground city maps; by the Association of Bay Area Governments; 1995; 4 maps; Berkeley Public Library. A map showing seismic hazard levels in the area. Coast Lines Depots; by Lee Gustafson & Phil Serpico; 1996; 240 pages; University of California Library. This book includes a good physical description of the Santa Fe Railway line that traversed El Cerrito in its short journey between Richmond and Oakland. Commemorative History of St. Jerome Church and Its Times; by Lewis Vincent; 1992; 44 pages; Parish Office at St. Jeromes Catholic Church. This work is a description of the first 50 years of the St. Jerome Catholic Church and its parish. A Continuing History of Contra Costa County; a compendium of articles from the Tri-Valley News; 1976; 110 pages; Contra Costa County Library. A series of articles published over a number of weeks that describe the history and growth of all parts of Contra Costa County. Contra Costa Cities and Towns - El Cerrito, 1934 - 1988; compiler unknown; 1988; 120 pages; Contra Costa County Library. This volume is an interesting collection of news stories clipped from local newspapers. Contra Costa Cities and Towns - El Cerrito (Supplement), 1948 - 1990; compiler unknown; 1990; 100 pages; Contra Costa County Library. This volume is an interesting collection of documents produced by the City of El Cerrito and news stories clipped from local newspapers. Contra Costa County from The Resources of California magazine; no author given; 1898; 20 pages; Richmond Public Library. An early illustrated look Contra Costa County. It is largely promotional. Contra Costa County California as Reviewed Under the Vitascope - Index ; by The El Cerrito Historical Society; 2007; this document can be found here. An index to the text and photos in the book. Using the index is slightly complicated, as the book does not have page numbers. Contra Costa County California as Reviewed Under the Vitascope; by William L. Metcalfe; 1902; 112 pages; Contra Costa County Library. The author in 1901 set off across the county with his pencil and pad handy and his photographers in tow to record what he saw and heard. Although it is clear that the subjects in many cases subsidized the printing of material about them, it is an interesting work and provides a great snapshot of Contra Costa County at that time. The original is rare; the 1994 reprint is more common. Contra Costa County - Historical and Biographical; by the Historic Record Company; 1926; 1100 pages; Contra Costa County Library. This book includes about 250 pages of history, followed by a chronology of events from 1858 through 1926, followed by about 700 pages of biographies, many with pictures, of various persons who lived in Contra Costa County. Creek & Watershed Map of Richmond & Vicinity; Oakland Museum of California; 2006; 2 pages; University of California Library. A wonderfully detailed and informative map of the creeks and watersheds in Richmond and El Cerrito; however, for unknown reasons, the map has arbitrarily assigned new names to several creeks. Diseño del Rancho de San Pablo; by James A. Forbes; 1830; 1 page; this document can be found here (2 megs.) 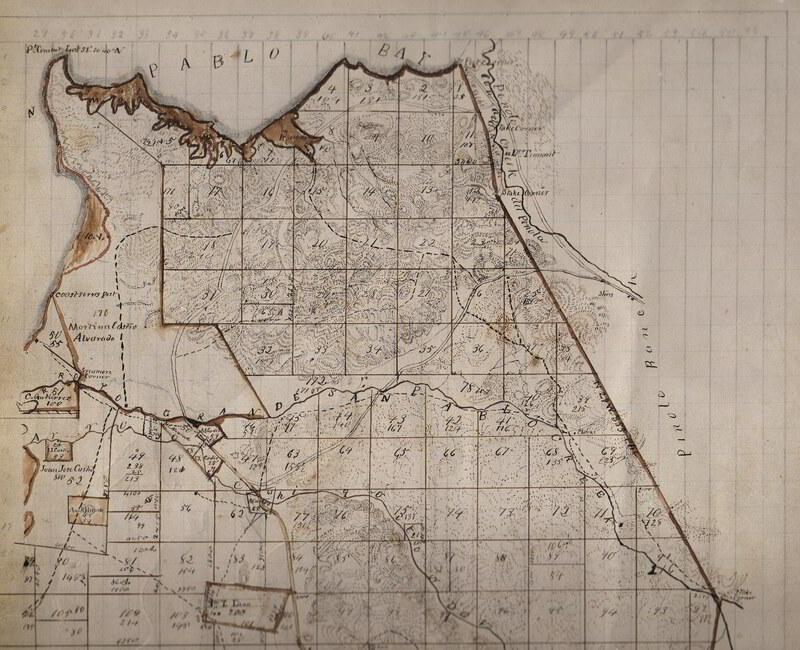 A wonderful map of Rancho San Pablo from 1830, the original captions are in Spanish. Ana Dominguez has kindly translated the captions into English, providing a remarkable look into how Rancho San Pablo and its original landforms were viewed in those days. The name “Forbes' Map” is sometimes used to refer to this document. Earthquake Exodus; by Richard Schwartz; 2005; 148 pages; Contra Costa County Library. An excellent work on how the East Bay cities, in particular Berkeley, reacted to the aftermath of the San Francisco earthquake. East Bay Then and Now; by Dennis Evanosky & Eric J. Kos; 2004; 144 pages; Contra Costa County Library. Old pictures of East Bay locations contrasted with current pictures taken in the same vicinity. The East Shore and Suburban Railway; by Erle C. Hanson; 1961; 30 pages; Richmond Public Library. The definitive work on the streetcar line that once ran from the Richmond - San Rafael ferry all the way to the El Cerrito/Albany City line on San Pablo Avenue. East Shore and Suburban Railway Chronology ; by The El Cerrito Historical Society; 2007; 8 pages; this document can be found here (1 Meg.) A chronological list of the significant events in the life of the East Shore & Suburban Railway and related East Bay rail history. " El Cerrito - 50th Anniversary; various articles and memorabilia; 1967; 25 pages; Contra Costa County Historical Society. A folder of articles and memorabilia relating to the 50th anniversary of El Cerrito. El Cerrito Annexations ; El Cerrito Historical Society; 1976; 1 page; this document can be found here. The boundaries of El Cerrito have changed very little since the city incorporated in 1917. In addition to the three annexations shown on this map there have been a few small annexations of property bordering Wildcat Canyon since 1956. Otherwise this map clearly indicates the area that El Cerrito has added since 1917. Battle of the Annex - El Cerrito and Richmond both tried in the 1920’s to add the area known as the “Richmond Annex” to their City. The City of Richmond eventually prevailed in 1927. The attached document describes what happened. El Cerrito Begins from Days Gone By in Contra Costa County - Volume 1; by Nilda Rego; 1997; 213 pages; Contra Costa County Library. A compendium of articles written by Nilda Rego for a weekly column in the Contra Costa Times newspaper. "El Cerrito City Council Members; compiled by the City of El Cerrito City Clerk; 2012; 8 pages; El Cerrito City Hall. This is a list of all the people who had served on the El Cerrito City Council and the dates they served. The City of El Cerrito has graciously allowed us to make it available here." El Cerrito City Limits (as originally proposed) ; Citizens Committee; 1917; 1 page; this document can be found here. This document is a description of the city limits as originally proposed and filed with the County Board of Supervisors on May 21, 1917. It is written in the classic “Meets and Bounds” style so to be fully understood it should be reviewed in conjunction with the Rancho San Pablo Map. El Cerrito City Limits (as revised by the Board of Supervisors) ; Contra Costa County Board of Supervisors; 1917; 1 page; this document can be found here. This document is a description of the City Limits as revised by the Board of Supervisors after reviewing the protests put forth by parties who did not want to be included in the new city. The election was held on August 16, 1917 and these boundaries became the city limits of the new city of El Cerrito . The document is written in the classic “Meets and Bounds” style so to be fully understood it should be reviewed in conjunction with the Bouquet Key Route Business Blocks tract map and the Rancho San Pablo Map - Southeast portion . El Cerrito Draft Citywide Historic Context Statement; by the El Cerrito Historical Society; 2012; 134 pages. This document is i) a discussion of why El Cerrito developed the way it did and ii) a description of the significant historical themes in the development of El Cerrito. The document is a draft and the preface describes what still needs to be done before the document is complete. You can download a copy from here. it’s about 19 mg.
El Cerrito, the Centennial Plan: A Community-based Vision to take El Cerrito into its Second Century; by the Prince of Wales's Summer School in Architecture and the Building Arts; 1997; 1 sheet; University of California Library. A summary of several proposals on future development in El Cerrito. El Sobrante Recollections; by the El Sobrante Rotary Club; 1984; 64 pages; Contra Costa County Library. A collections of interviews with natives and others who are familiar with the history and culture of El Sobrante. Endangered by Development:10848 San Pablo Avenue, El Cerrito; Tom Panas; April 2011; 6 pages; Contra Costa County Library. In early 2011 the East Bay branch of the American Institute of Architects put out a request for information on critically endangered historic proprieties in the East Bay. The Fages-Crespi Expedition of 1772; compiled by Janet Newton and Virginia Bennett of the Amador-Livermore Valley Historical Society; 1976; 23 pages; University of California Library. This booklet contains excerpts from the letters and journals of Lt. Pedro Fages and the journals of Father Juan Crespi relating to their 1772 expedition to the East Bay. The Final Years of Gambling In El Cerrito; compiled by the El Cerrito Historical Society; 1949; 53 pages; it can be downloaded from here (about 16 Meg.). This document contains newspaper articles from 1949-1955 relating to the close of the gambling era in El Cerrito. The El Cerrito and California scene at the time included California Attorney General (and eventual Governor) Edmund G. “Pat” Brown, California Governor (and eventual Supreme Court justice) Earl Warren; well-known gambling bosses Fred Grunewold, Dave Kessel, William N. “Big Bill” Pechart, E. L. “Buster” Price, and Elmer “Bones” Remer; The Wagon Wheel, and many more people and places. Joseph Emeric vs. Henry V. Alvarado - Additional Findings and Interlocutory Decree; by the Supreme Court of California; 1889; 677 pages; Contra Costa County Library. This volume is the court’s final word about who had proper title to land in the long and famous saga of the Rancho San Pablo land case. The outcome of this case was a list of which individuals owned the land in Rancho San Pablo and how much land they owned. However, it was the “Final Decree in Partition” by Judge J.C.B. Hebbard on March 3, 1894, that once and for all settled all disputed land titles in Rancho San Pablo. The Final Decree dictated where the land owned by each of the valid titleholders was located, bringing to a close a 40-year history of litigation regarding who owned what in Rancho San Pablo. It was not until this case was decided that Rancho San Pablo could be subdivided for development. A Farewell Photo Tour - El Cerrito High School; by J.J. Dilberto; 2005; 32 pages; reference pamphlets file at the El Cerrito Library. This book records El Cerrito High School as it looked just before it was torn down in 2005. Fiesta del Cerrito: official program; by the Fiesta Committee to benefit the El Cerrito Youth Foundation; 1948; 48 pages; Contra Costa County Historical Society. The program of the Festival del Cerrito held September 13 to 19, 1948. First Lady of Rancho San Pablo, Martina Castro de Alvarado; by Frances Conley**; 1999; 63 pages; reference pamphlets file at the El Cerrito Library. The story of Martina Castro de Alvarado (the sister of Victor Castro), who became the wife of Juan Bautista Alvarado, a Governor of Mexican California and after that became the most prominent woman in western Contra Costa County into the modern era. It includes an excellent bibliography/reading list. First Settlers: The Castros of Rancho San Pablo; by Frances Conley**; 1980; 27 pages; Contra Costa County Library. This book tells the story of the Castro family, the first Spanish settlers in Rancho San Pablo. Forbes's Map – see the entry for Gray's Map. The Formation of Country and Western Swing Bands in Richmond, California, during World War II; by David Washburn; 2003; 41 pages; University of California Library. A UC Berkeley senior thesis on the evolution of and the impact of the flood of shipyard workers on the El Cerrito/Richmond band scene during World War II. It has an interesting bibliography. From a Rancho to a City called San Pablo; edited by Beth Hansen; 1999; 147 pages; Contra Costa County Library. Pictures and vignettes of life in San Pablo from the days when it was the largest and most important town in the west county area up to today. Genealogy of the Family of Francisco Maria Castro, Grantee of the Rancho San Pablo, Including the Genealogy of Gov. Juan Bautista Alvarado; by Earl Conley**; 1987; 38 pages; reference pamphlets file at the El Cerrito Library. This volume is primarily genealogical tables of the Francisco Castro (the father of Victor Castro) and Juan Alvarado families. This document may also be found here. Geologic Guidebook to the San Francisco Bay Counties; by Olaf Pitt Jenkins/The California Division of Mines; 1951; 392 pages; Contra Costa County Library. 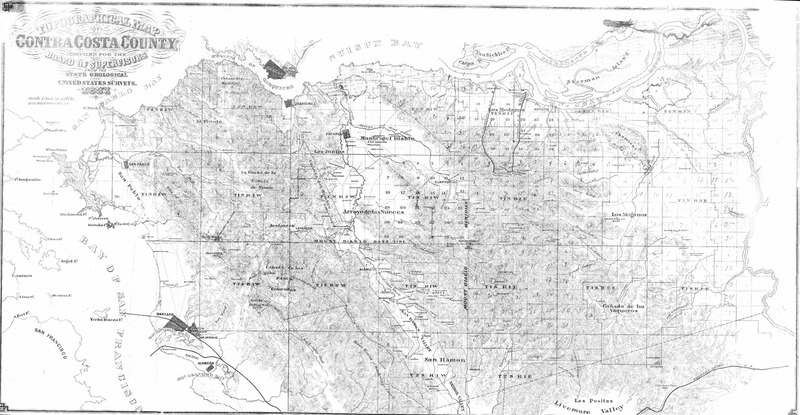 A complete description of the geology of the nine Bay Area Counties. Geotechnical Investigation of the Blakemont Landslide Located in Kensington and El Cerrito, California ; Seidelman Associates, Inc.; 1994; 300 pages; vertical file at the Kensington Library. This report describes the results of almost eight years of study of the Blakemont Landslide area. It was prepared for the Blakemont Property Owners Association. Gray's Map; by Nicholas Gray; 1856; 4 pages; the map was recorded at the County Recorder 's office as 4 separate pages and each page is available here: NW NE SW SE . The property owners of Rancho San Pablo are believed to have commissioned this map to help understand exactly who owned which pieces of land in Rancho San Pablo. Nicholas Gray was a U.S. Deputy Surveyor. 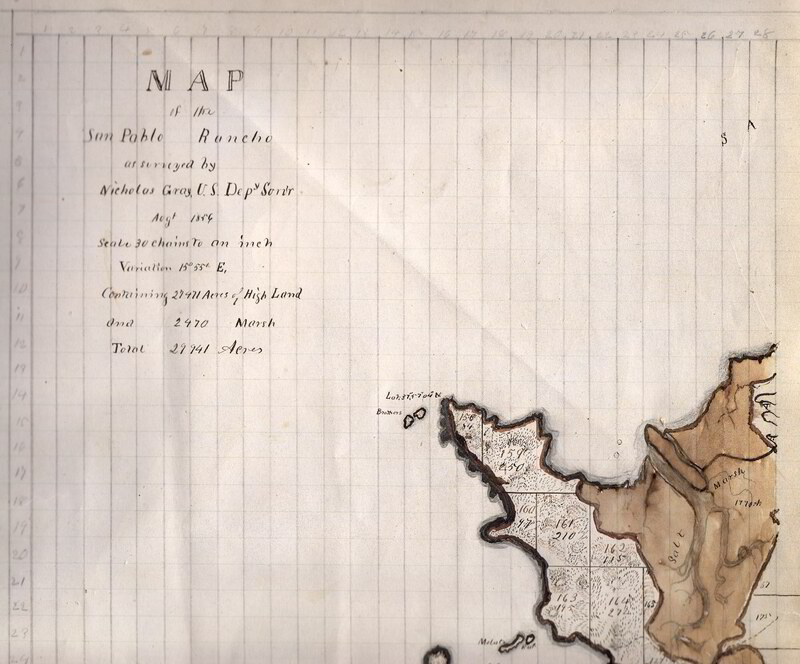 A James Forbes was also associated with the project and sometimes this map is referred to as “Forbes's Map”. There was also one other person who is listed as having participated in this project but his name is unknown. Historical memoirs of New California, Francisco Palóu; 1926; 4 volumes; University of California Library. (Translated into English from the manuscript in the archives of Mexico and edited by Herbert Eugene Bolton.) A history of Alta California and the Franciscan missions during the time of Father Palou's association with them. It contains Palóu 's account of the writings of many of the early Spanish explorers of California as well as many important documents. It includes: "Copia del diario que se formó en el registro que se hizo del puerto de San Francisco" (Mar. 20-Apr. 5, 1772”; Father Juan Crespi’s description of the 1772 trip when he, Lt. Pedro Fages, and some others were the first Europeans to visit and map El Cerrito and much of the East Bay. The Spanish version is "Noticias de la Nueva California "
An Historical Review of the East Bay Exchange; by R.S. Masters, R.C. Smith, and W.E. Winter; 1927; 119 pages; Contra Costa County Library. An interesting historical review of the area from San Leandro north through El Cerrito with a particular emphasis on phone service. History of California Post Offices, 2nd Edition; by Harold E. Salley & Edward L. Patera; 1991; 344 pages; Oakland Public Library. This volume includes information on the four post offices that have served the El Cerrito area since 1889. History of Cattle in Contra Costa County; by Ted Bresnahan; 1970; 28 pages; Contra Costa County Library. This book gives the early history of cattle ranching in Contra Costa County from the Rancho days forward and describes some of the problems that occurred, including the devastating hoof & mouth epidemic of the 1920’s. History of Cattle Raising in Contra Costa County; by William H. Baumgartner; 1970; 30 pages; Contra Costa County Library. This book gives the early history of cattle ranching in Contra Costa County from the Rancho days forward. History of Contra Costa County; by Mae Fisher Purcell; 1940; 742 pages; Contra Costa County Library. This book includes both historical and current information on Contra Costa County. Of particular note is the list of all individuals to hold a county office up through the year of publication (1940). History of Contra Costa County California; by J.P. Munro-Fraser/W.A. Slocum & Co; 1882; 704 pages; Contra Costa County Library. The first significant reference book written about Contra Costa County. It includes considerable physical description of Contra Costa County, incidents of pioneer life, a description of each township, and about 200 pages of biographical sketches. The original is rare; the 1974 and 2000 reprints are more common. The History of Contra Costa County California; by F.J. Hulaniski; 1917; 623 pages; Contra Costa County Library. This book includes about 400 pages of description of the county and the cities in the county, followed by about 200 pages of biographies, some with pictures, of various persons who live in Contra Costa County. History of El Cerrito; by the El Cerrito Chamber of Commerce and the El Cerrito Historical Society; 1980; 3 pages; reference pamphlets file at the El Cerrito Library. The brochure provides a concise history of the El Cerrito area. A History of Richmond, California; by Joseph C. Whitnah; 1944; 128 pages; Contra Costa County Library. A description of the growth and business activity of the City of Richmond, with particular focus on the major industries. Includes a complete and concise list of the 148 persons identified as valid owners of property in Rancho San Pablo (and the amount of land to which they were entitled) as listed in the final decree in partition by Judge J.C.B. Hebbard on March 3, 1894. This decree was the final word on the 40 years of litigation in the famous Rancho San Pablo land case. How the County Looked in Earliest Times; by W. T. Helms; no date; 11 pages; Richmond Public Library. A brief description of Contra Costa County in the early days. I Never Saw One Laugh; by Linda Stevens Switzer; 1969; 41 pages; Contra Costa County Library. An Ethno-history of San Francisco Bay Indians, based on accounts of early visitors to the area. The title is a quote from Louis Choris, the artist on the Rurik. (The Rurik was Russian ship that visited California in 1816 as part of a round the world voyage; Choris’s sketches of the people and places the Rurik visited are the only known images of a number of subjects.) Choris was commenting on the sad plight and state of mind of the Indians who were forced by the Franciscan fathers to live at the missions. The bibliography is terrific. Illustrations of Contra Costa County, California with Historical Sketch; by Smith & Elliott; 1879; 180 pages; Contra Costa County Library. This book was the first history and description of Contra Costa County that was published. It includes a description of Contra Costa County plus historical accounts of California; Contra Costa County elected officials and voting districts; distances of prominent points from Mt. Diablo; many tables of things such as population, agricultural statistics, property values, rain tables; and much more. The original is rare; the 1952 reprint is more common. Images of America: Richmond; by Donald Bastin; 2003; 128 pages; Contra Costa County Library. A collection of pictures and historical snippets about Richmond. The Indians of Contra Costa County; by Charles A. Bohakel; 1977; 40 pages; Contra Costa County Library. A description of the Indians who inhabited Contra Costa County before the Spanish settlers arrived. Insurance maps of Richmond, California (includes El Cerrito); by the Sanborn Map Company; 1930; 50 pages; University of California Library. The scale of “Sanborn maps” is such that the size and shape of every building on each block is show. In some cases the owner and type of building is given as well. These maps were created for most cities across the US to facilitate fire insurance underwriting. They contain a wealth of information. Its Name was M.U.D. ; by John Wesley Noble/Ida McClendon; 1999; 332 pages; Contra Costa County Library. Its name was M.U.D. (Volume I), written by John Wesley and first published in 1970, tells the story of the early East Bay water systems. In 1998 EBMUD wrote Volume II, covering years 1968-1998. This edition is a combined volume I and II. Japanese Nurseries in El Cerrito and Richmond ; El Cerrito Historical Society; 2002; 1 page each; three documents are available. The northern El Cerrito/Richmond border area was at one time covered with wholesale nurseries, most of them belonging to Japanese families. The first families arrived in the area at the turn of the century. Click here (16K) see a table of information about these growers. Click here (361K) to see a map of the nurseries in the Richmond/northern El Cerrito border area. Click here (374K) to see a map of the nurseries in the Brookside/West Richmond area. Click here (1.9M) to see a commemorative book about the Japanese nurseries in El Cerrito and Richmond. Japanese Nurseries; in El Cerrito and Richmond: "Click here to see the a statement by the National Park Service on the significance of the history of the Japanese American flower industry in Contra Costa County." The document is attached. Journey to a Distant Shore; by Frances Conley**; 1984; 99 pages; reference pamphlets file at the El Cerrito Library. This work tells the story of the first Mexican settlers who came to California. It includes an excellent bibliography/reading list. Kensington - Past and Present; by the Kensington Improvement Club; 2000; 136 pages; Contra Costa County Library. Pictures and stories of Kensington over the years. Landslides of the Berkeley Hills; from Alan Kropp & Associates; 1995; 1 page; one document is available. This excellent map from Alan Kropp & Associates clearly shows landslide hazard areas in northern Berkeley, Kensington, and southern El Cerrito. Click here (341K) to see a 1995 version of the map. The Last Whistle; by Jack R. Wagner; 1974; 135 pages; Contra Costa County Library. A book about the Ocean Shore Railroad. This book contains the only known reference in print to the Bates & Borland Company, which ran a quarry in El Cerrito in early times. The Little Hill; by George D. Miner (Richmond School District); 1957; 18 pages; Contra Costa County Library. A book for primary-grade children about the origins of El Cerrito. Living with Flowers; by Gary Kawaguchi; 1995; 120 pages; Oakland Public Library. The history of the California Flower market, the wholesale market where all the Bay Area Japanese flower growers, including those from Richmond and El Cerrito, sold their flowers. The Long Road to Rancho San Pablo; by Frances Conley**; 1989; 34 pages; Contra Costa County Library. The story of Francisco Castro, whose herds of cattle once roamed the entire northeast shore of San Francisco Bay. It begins with the family’s departure from Sinaloa, Mexico as part of the Anza expedition and continues forward to the eventual establishment of Rancho San Pablo. Melange and Fault Rocks Exposed in and Around An Abandoned Quarry At The Schmidt Lane Recycling Center, El Cerrito, California; by John Wakabayashi, Ph.D., and Edmund W. Medley, Ph.D.; 2002; 17, 3, and 29 pages. This somewhat technical but quite interesting document has a detailed description of the very fractured and jumbled mass of rocks that underlies our hills in El Cerrito. It was included in an Association of Environmental & Engineering Geologists field trip in 2002. Click here to download the main document (795K); click here to download Appendix A, which describes the larger geologic context of California tectonics, bimrocks, and fault rocks (42K); and click here to download Appendix B, which establishes some guidelines to characterization of Franciscan melanges and other bimrocks (705K). Mira Vista Golf & Country Club - Founded in 1920 as the Berkeley Country Club today's Mira Vista Golf and has seen a number of changes over the years. Click here to see George Collier's 1977 article on Mira Vista and his research notes on Mira Vista. A Narrative History of Contra Costa County; by George C. Collier; 1983; 172 pages; Contra Costa County Library. A wide-ranging history of the county that pays particular attention to the land grants and also provides information on the islands in San Francisco and San Pablo bays. Not at Home on the Home Front; by Donna Graves; 2004; 380 pages; Richmond Public Library. This monograph consists of interviews with Japanese-Americans and Italian-Americans who were sent to internment camps or had friends who were sent to internment camps during World War II. Noticias de la Nueva California; by Francisco Palóu; 1874; 4 volumes; University of California Library. In Spanish, a history of Alta California and the Franciscan missions during the time of Father Palou's association with them. It contains Palóu 's account of the writings of many of the early Spanish explorers of California as well as many important documents. It includes: "Copia del diario que se formó en el registro que se hizo del puerto de San Francisco" (Mar. 20-Apr. 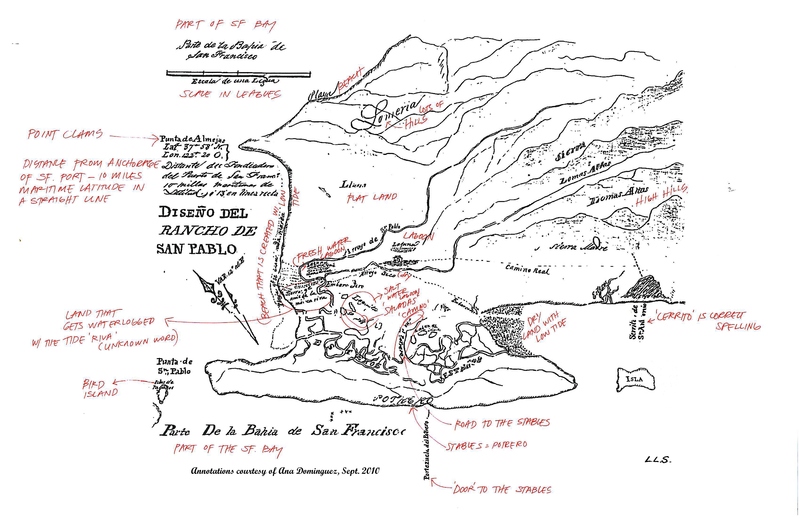 5, 1772”; Father Juan Crespi’s description of the 1772 trip when he, Lt. Pedro Fages, and some others were the first Europeans to visit and map El Cerrito and much of the East Bay. The English version is "Historical memoirs of New California ". The Numbered Roads in Rancho San Pablo ; El Cerrito Historical Society; 2007; 2 pages; this document can be found here . In the years before any cities were incorporated in Rancho San Pablo, the County built the roads and gave numbers (rather than names) to those roads. This document uses today's names to describe where the old numbered roads ran. Of Walking Beams and Paddle Wheels; by Harlan & Fisher; 1951; 157 pages; Contra Costa County Library. This book is a chronicle of San Francisco Bay ferryboats. The Ohlone Way; by Malcolm Margolin; 1978; 190 pages; Contra Costa County Library. An excellent description of how the Ohlone Indians (including our local tribe, the Huchiun) lived before the Spanish arrived. It has a wonderful bibliography. Old Bars, Restaurants, and Businesses in El Cerrito; Click here to see a list of a number of old businesses in El Cerrito. This list was built up from old directories, promotional materials, and the memories of old-timers. At the top there is a key for the type of businesses. The list runs from the south (including a few spots of note in Albany) to the north and includes businesses off San Pablo Avenue as well as on San Pablo Avenue. Cross streets along San Pablo Avenue are indicated. Corrections and additions are welcome. Old California Houses: Portraits and Stories; by Marian Randall Parsons; 1952; 145 pages; Contra Costa County Library. This book contains descriptions of many of the original Spanish adobes in California (and their occupants), including Victor Castro’s Adobe in El Cerrito. Old Times in Contra Costa; by Robert Daras Tatam; 1996; 201 pages; Contra Costa County Library. Text and vintage pictures describing Contra Costa County scenes and events in earlier times. The Open Space and Conservation Element of the General Plan ; by the Tri-Cities Citizens Advisory Committee on Open Space and Conservation; 1973; 110 pages; University of California Library. A report to the cities of El Cerrito, Richmond, and San Pablo to i) help identify and protect the natural resources of the area and ii) encourage growth in the areas where it is most suited. Outline History of Eskaton Hazel Shirley Manor ; by Art Schroeder; 1986; 10 pages; Contra Costa County Library. A history and description of the genesis and evolution of the Eskaton Hazel Shirley Manor senior housing development and the key persons involved in the effort. An Overview of the Huchiun Band of The Ohlone Along the San Pablo Bay; by Michael Ali (Cherokee); 2003; 50 pages; Richmond Public Library. A description of the life and culture of the local Indian groups before the Spanish arrived. The Parks and open spaces in El Cerrito have seen enormous changes over the years. Serveral revealing documents have been put together over the years that despribe how the parks system has evolved. Click here to see a 1954 Oakland Tribune article about plans for parks. Click here to see the 1964 Plans for Parks. Click here to see a 1966 review of current parks and proposed enhancements. 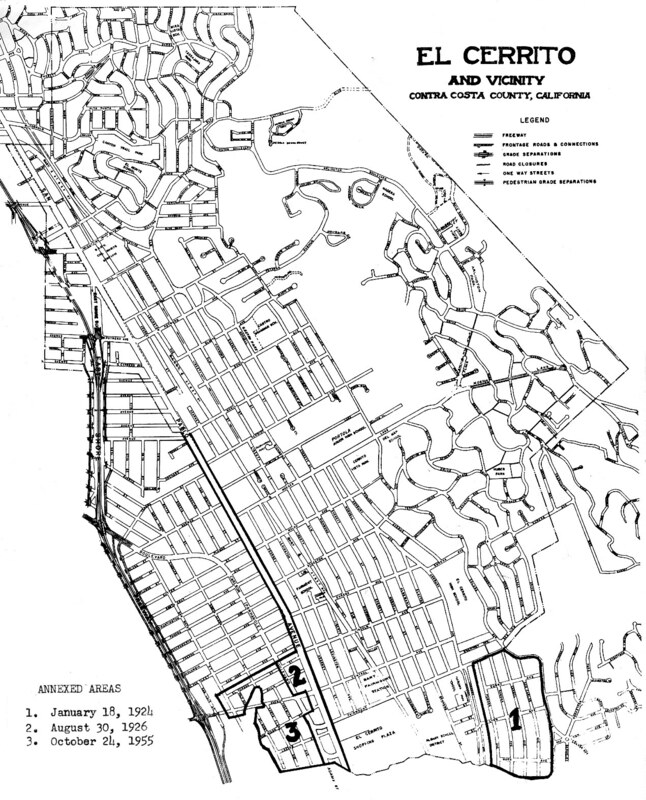 Click her to see excerpts from a 1979 analysis of El Cerrito's Parks and Recreation system. Photographing the Second Gold Rush; by Dorthea Lange; 1995; 86 pages; Contra Costa County Library. A description in pictures and text of the area from Oakland to Richmond as it absorbed more than 100,000 people who came to the area to work in the Richmond shipyards from 1941 until 1945. The Politics of a Canine Landscape - Point Isabel Regional Park; by Suzanne Jeanne Arca; 1992; 185 pages; Richmond Public Library. A senior thesis at the College of Environmental Design, UC Berkeley. Pre-Americans at Play in Contra Costa County; by Bernard Freeman; 1987; 37 pages; Contra Costa County Library. A description of the games played in California by its residents before the Gold Rush. A Proposal for the Development of the East Shore Tidelands of San Francisco Bay ; Prepared for the Atchison, Topeka and Santa Fe Railway Company by Victor Gruen Associates; 1963; 42 pages; Richmond Public Library. 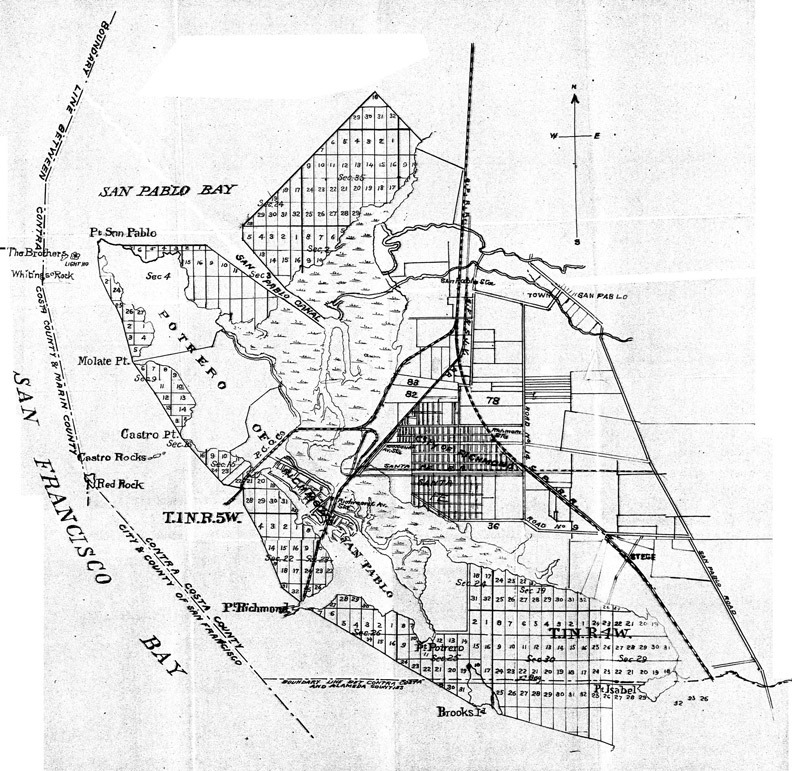 The Santa Fe Railway purchased the San Francisco Bay tidelands between Emeryville and Richmond in the first part of the 1900s. This document reviews prior proposals to develop the East Shore tidelands and then proposes a colossal plan to fill most of the East Bay tidelands in the area and develop office, residential, recreational, commercial, and industrial spaces. Preliminary Historic Resources Inventory, Contra Costa County; by the Contra Costa County Planning Department; 1976; 80 pages; Contra Costa County Library. This volume contains tabular information about the type and nature of historic places and sites across the county. 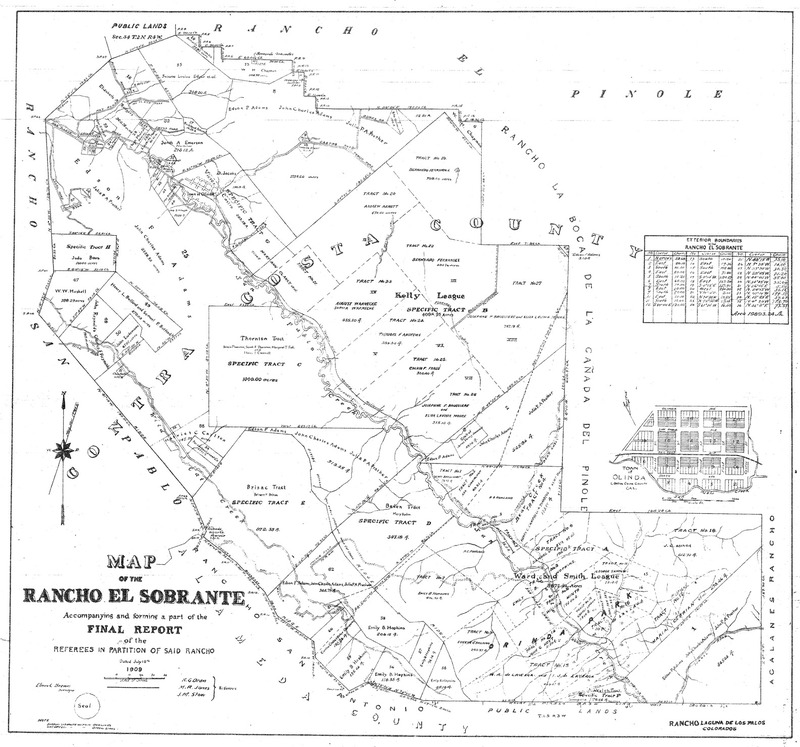 Rancho El Sobrante Map; Referees appointed by the Supreme Court of California; 1909; 1 page; this document can be found here (1.7 MB). This map shows the borders of and landowners in Rancho El Sobrante as set down by the Court at the close of the final court case regarding land ownership in Rancho El Sobrante. 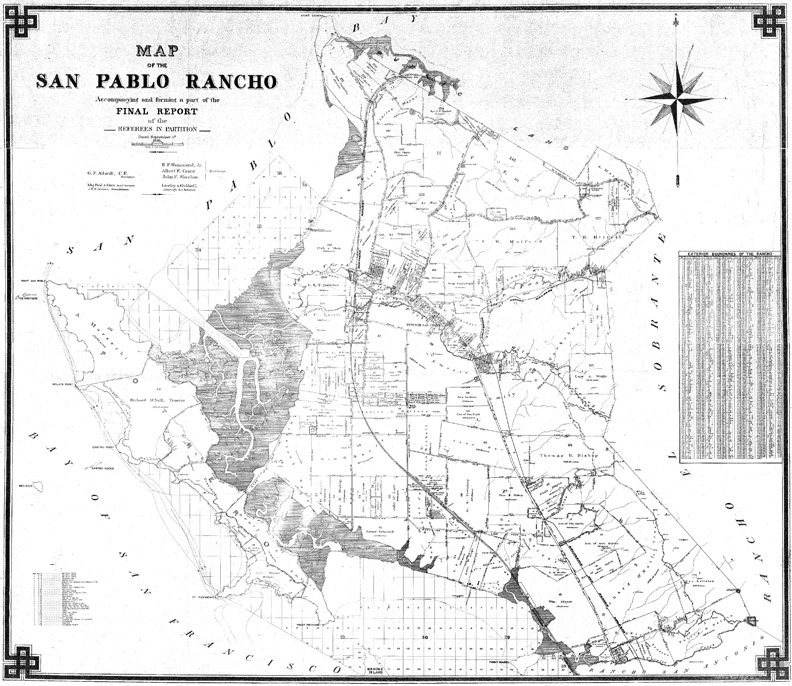 Rancho San Pablo Map ; Referees appointed by the Supreme Court of California; 1894; 1 page; this document can be found here (2.9M). This map shows the borders of and landowners in Rancho San Pablo as set down by the Court at the close of the final court case regarding land ownership in Rancho San Pablo. 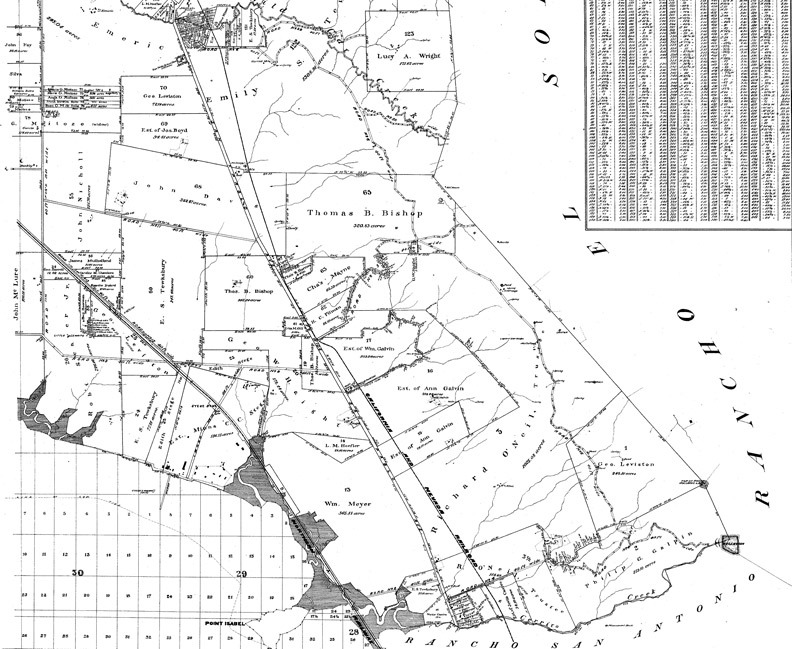 Rancho San Pablo Map - - Southeast portion; Referees appointed by the Supreme Court of California; 1894; 1 page; this document can be found here (1.8 MB). This map shows the borders of and landowners in the southeast corner of Rancho San Pablo (the El Cerrito area) as set down by the Court at the close of the final court case regarding land ownership in Rancho San Pablo. Rancho San Pablo Map - Western portion ; Richmond Incorporation Committee; 1903; 1 page; this document can be found here (1.5M ). This map shows the portion Rancho San Pablo west of San Pablo Avenue and south of San Pablo Creek marsh. Of the greatest importance is that this map clearly shows all the “tideland” or “water” lots and the identifying nomenclature assigned to each one. 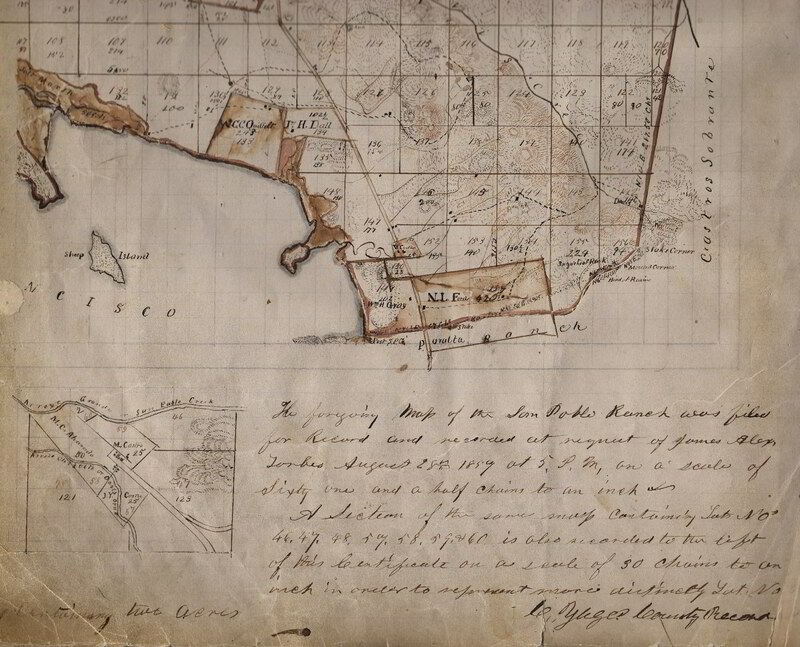 At some point in the late 1800s or early 1900s the tidelands between the San Pablo Creek marsh and the Alameda County line were surveyed as if they were on dry land (or the bay was filled). This information is not shown on many maps. Many of the early legal descriptions of Richmond include references to the tideland or water lots. Rancho San Pablo Partition Final Land Owners ; excerpted Joseph C. Whitnah's A History of Richmond ; 1944; 6 pages. Click here to see the list of landowners in Rancho San Pablo per Judge J. C. B. Hebbard's Decree of Partition in March of 1894. While the list does not total exactly the 17,938 59/100 acres partitioned out by Judge Hebbard (it's about 4% short), it is nonetheless a very useful reference. Records of the El Cerrito branch of the National Association for the Advancement of Colored People; by the NAACP El Cerrito branch; 1970-78; 3 cartons; University of California Library. Records and documents relating to the activities of the El Cerrito NAACP branch. Red Trains in the East Bay; by Robert S. Ford; 1977; 351 pages; Contra Costa County Library. This book is the definitive work on the Southern Pacific’s interurban railroad network, the “Red Trains”. It includes a short section on the Southern Pacific’s plan to build a line that extended to the north as far as Richmond (via Carlson Boulevard) as a branch off of the line that ran down Solano Avenue. Report on Proposed Park Reservations for East Bay Cities; by Olmsted & Hall; 1930; 40 pages; Contra Costa County Library. This is the famous Olmsted-Hall report which was the basis for the creation the East Bay Regional Park System. Richard Stege, Entrepreneur from Days Gone By in Contra Costa County - Volume 3; by Nilda Rego; 2005; 192 pages; Contra Costa County Library. A compendium of articles written by Nilda Rego for a weekly column in the Contra Costa Times newspaper. Richmond, Arsenal of Democracy ; by The International Brotherhood of Boilermakers, Iron Ship Builders and Helpers of America; 1947; 103 pages; Richmond Public Library. An interesting look, from the perspective of a key labor union, at the overnight transformation of the City of Richmond into an industrial powerhouse during World War II. Richmond Independent newspaper, Special Souvenir Edition; edited & compiled by the Women’s Improvement Club; 1910; 44 pages; Richmond Public Library. This work includes a number of interesting stories & articles about the Richmond area in the early days. Richmond: the Early Years; by Independent Printing; 1960; 20 pages; Richmond Public Library. A large-format booklet about the Richmond area’s early years and development. Richmond: the Pittsburg of the West; by the Richmond Chamber of Commerce; 1907; 60 pages; Richmond Public Library. As befits the era and author, a rose-colored view of the City of Richmond, touting the city’s land, industry, people, location, and future prospects. Richmond - Windows to the Past; by Susan D. Cole; 1980; 96 pages; Contra Costa County Library. Pictures and vignettes about early Richmond, including perhaps the best information available on the Belgum family’s Grande Vista Sanitarium, which was located near the mouth of today’s Wildcat Canyon Regional Park. The Richmond Shipyard Railway from Western Railroader magazine; by Francis E. Guido; Sept. 1981 issue #491; 8 pages; reference pamphlets file at the El Cerrito Library. A short description of the Richmond Shipyard Railway, which ran from Emeryville to the Richmond shipyards in the latter years of World War II. Richmond Streetcars from Western Railroader magazine; by Erle C. Hanson; Nov. 1957 issue #217; 14 pages; reference pamphlets file at the El Cerrito Library. A brief description of the East Shore and Suburban Railway, which ran from the Richmond - San Rafael ferry all the way to the El Cerrito/Albany City line on San Pablo Avenue. This article has a number of errors that were corrected in Mr. Hanson's subsequent work The East Shore and Suburban Railway. The Rifle Range in El Cerrito - This article from the January 1939 edition of the California Guardsman magazine describes the construction and early configuration of the rifle range in Wildcat Canyon. In subsequent years targets were set up across the canyon on the east side of Wildcat Creek to provide gunnery practice for tose honing their skills on larger weaponry. Click here to read the article. Santa Fe - Steel Rails Through California; by Donald Duke & Stan Kistler; 1963; 184 pages; Contra Costa County Library. This book includes a few pictures of the Santa Fe Railway line that traversed El Cerrito in its short journey between Richmond and Oakland. A Selective History of the Codornices - University Village; by Warren F. Lee and Catherine T. Lee; 2000; 412 pages; Contra Costa County Library. A good reference on the development of Albany’s University Village and on the part of the Richmond Shipyard Railway that traversed the area during World War II. It includes an extensive chronology. The Seismic Safety Study for the General Plan ; by the Tri-Cities Citizens Advisory Committee on Seismic Safety; 1973; 199 pages; Richmond Public Library. A report to the cities of El Cerrito, Richmond , and San Pablo on earthquake hazards and recommended measures to reduce those hazards. Shellmounds of the San Francisco Bay Region; by W. C. Nelson; 1909; 48 pages; Richmond Public Library. An overview of the various Indian shellmounds found in the Bay Area. A Short History of Contra Costa County; by Harold E. Davis; 1965; 67 pages; Contra Costa County Library. A description of Contra Costa County with a focus on early history, land grants, and founding of cities. It has a chronology of Contra Costa County up to 1941 and also a list of all Spanish, Mexican, and U.S. Military governors of California. Soil Survey of Contra Costa County; by the U.S. Department of Agriculture Soil Conservation Service; 1977; 170 pages; Richmond Public Library. This book has a comprehensive description of the various soils found in Contra Costa County. Some Historical Data on Camp Herms; by Victor Linblad; 1958; 16 pages; the Mt. Diablo Silverado Council of the Boy Scouts of America has kindly allowed us to make this document available here. This document is a thorough review of the development of Camp Herms during its first 30 years. Stories of Albany; by Catherine Janes Webb; 1983; 192 pages; Contra Costa County Library. Pictures and vignettes of life in Albany from the early days up to 1983, when the book was published. The Story of Albany; by the Albany Police & Fire Civil Service Club; 1947; 98 pages; Contra Costa County Library. Pictures and stories of Albany from the early days up through World War II. The Story of Chung Mei; by Charles R. Shepard; 1938; 264 pages; Berkeley Public Library. The story of the efforts by Charles R. Shepard in the first part of the 1900’s to create the only shelter and residential home in the East Bay for abused and abandoned Chinese boys. The Story of Contra Costa County ; by the Richmond Schools Department; ca. 1950; 44 pages; El Cerrito Historical Society collection. A decent history of Contra Costa County from pre-Spanish times up to the Gold Rush but the miserable living conditions the Spanish created for the Indians are papered over. The last 16 pages are stories written primarily by sixth-grade students in the district. There are some typographical errors in the document. The Story of Contra Costa County California; by the Contra Costa County Development Association; 1936; 28 pages; Contra Costa County Library. This large format, color promotional booklet presents a very rosy picture of the county’s development, facilities, and activities. The Story of Contra Costa County for Boys and Girls; by Wilma G. Cheatham; 1942; 229 pages; Contra Costa County Library. A textbook for grade school children about Contra Costa County. It includes a good California and Contra Costa County chronology. The Story of Rancho San Antonio; by Daisy Williamson De Veer; 1924; 93 pages; Contra Costa County Library. The story of Rancho San Antonio, the lands granted to the Peralta family, which ran from San Leandro on the south to Cerrito Creek on the north. The Story of Richmond; by Lee Fridell; 1954; 165 pages; Contra Costa County Library. A dated but very good textbook that describes Richmond and other west county towns including El Cerrito in the 1950’s. It includes an interesting section on El Cerrito aviation pioneer Pierre Allinio. The Story of Richmond Schools; by Walter T. Helms; 1958-59; 10 pages; Richmond Public Library. A compilation of several articles about the Richmond Schools originally printed in the Richmond Museum Association’s publication The Mirror. The Vegetation Cover of the San Francisco Bay region in the Early Spanish Period, by William C. Clarke, an M.A. Thesis at UC Berkeley, June 1959, 220 pages. This document is an amazing resource regarding how the land appeared when the first Spanish Explorers arrived and how some of their comments should be interpreted. Much of it is based on the maps, records, and diaries created by the first explorers of the area. A Survey of Kensington; by the Kensington Improvement Club; 1966; 24 pages; Contra Costa County Library. A description of the physical and social characteristics of Kensington. It has a good chronology regarding Kensington. A Survey of Kensington; by the Kensington Improvement Club; 1978; 54 pages; Contra Costa County Library. A description of the physical and social characteristics of Kensington. It has a good chronology regarding Kensington. Tales from the Iron Triangle; by James Polese; 1995; 88 pages; Contra Costa County Library. An enjoyable description of boyhood days in the 1920’s in the Richmond area. TEPCOWARE from American Craft magazine; by Joseph Heaven & Steve Selvin; Aug/Sept 1982; pages 16-19; American Craft has kindly allowed the Historical Society to reproduce the article here (all .pdfs): p.1 p.2 p.3 p.4 This is an excellent article about the Technical Porcelain and Chinaware Company. “TEPCO” was for many years the largest employer in El Cerrito. The office and factory were located behind City Hall, at Manila Avenue and Kearney Street. Topaz Consumers’ Cooperative, Second Anniversary Edition; by the Topaz Consumers’ Cooperative, 1944, 219 pages.. This is an image of the book put together by the cooperative organization at the Topaz internment camp in Utah during World War II. The Topaz camp is where most Japanese from Western Contra Costa County were interned. This book provides the most detailed look that exists about the operation of the coop and the internees. It is almost entirely in Japanese but is currently being translated. The book was provided by area native Meriko Maida. You can download a copy from here; it’s about 15 mg.
Tract maps; various authors; 1894+; each map 1 - 4 pages; County Recorders Office. These maps describe subdivisions as they were originally submitted to the county for approval. The subdivisions were not always built as the maps indicated. Valley Division Vignettes; by J.L. Krieger; 1983; 254 pages; University of California Library. This book includes a few pictures and the derivation of the station names on the Santa Fe Railway line that traversed El Cerrito in its short journey between Richmond and Oakland. Victor Castro: Stranger in a Familiar Land ; by Robert Brady; 2008; 20 pages. Click here to see an excellent review and analysis of the forces that led to the disintegration of the once-vast landholdings of Victor Castro. Views of the Castro Adobe; by various photographers; 1956; 8 pages; University of California Library. Photographs of the Castro Adobe taken shortly before it was destroyed by fire in 1956. The Way We Were; collaborative effort; 1996; 62 pages; Richmond Public Library. Brief autobiographies of a number of the Japanese families who owned and worked in nurseries in the El Cerrito and Richmond areas. It was written as part of a reunion of the growers in 1996. The Will of Julia Β. Castro/Petition for Final Distribution; Julia B. Galpin, Executrix; 1902; 26 pages; this document can be found here. Victor Castro was widowed twice but he was survived by his third wife, Julia Townsend Lupton Beardsley Castro. Not surprisingly the documents indicate that John Davis, William Rust and Thomas Conlon were the appraisers of the estate. ** Frances & Earl Conley are an authoritative source of information on the Castro family. They have developed a deep and comprehensive knowledge of the history of the Castro family through their translations of a number of Spanish works into English and their multiple trips to Mexico to research the Castro family.